Members of Sisters of Grace prayed during the celebration for the Sisters of Charity in St. Agatha Church in Milton. 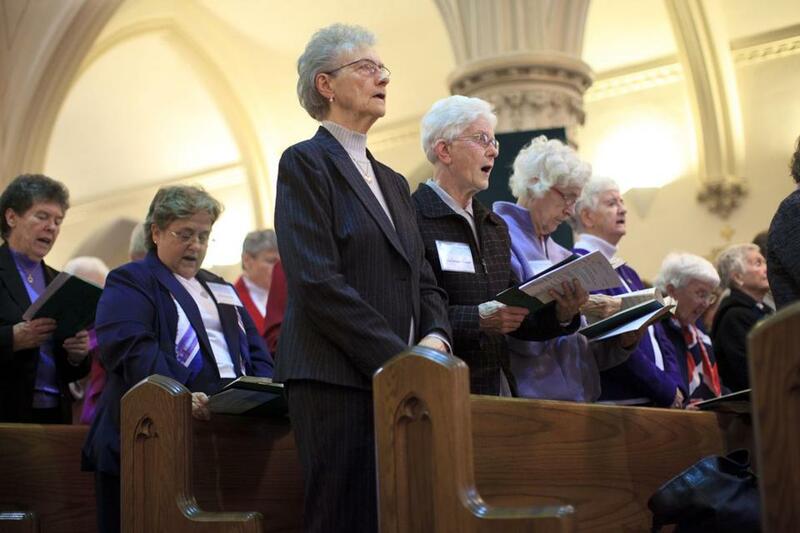 Voices rose in hymns of thanksgiving at St. Agatha Parish in Milton on Sunday, as more than 300 people celebrated the 125th anniversary of the Sisters of Charity-Halifax in the Archdiocese of Boston. To mark the occasion, Sister Donna Geernaert, congregational leader for the order, announced donations of $25,000 each to St. Patrick School in Roxbury and the WAITT (We’re All in This Together) House, an adult education center in Roxbury founded by the order in 1979. “I like to think of it as a time for rejuvenation,” Geernaert said. Looking forward, two growing interests for the order are ecological projects and helping victims of human trafficking, issues they are working on with the Leadership Conference of Women Religious. Geernaert said that while the Sisters’ work is branching into new directions, it carries on the tradition of St. Vincent de Paul in serving the poor wherever they are found. “We express our love for God by the way we relate to one another,” she said. Sisters from the order first settled in Boston in August 1887, called to staff a new school for girls at St. Patrick’s Parish in Roxbury. Over time, they expanded to new schools in Dorchester, Needham, Wellesley, Medford, Lowell, Lawrence, and North Andover. After the Second Vatican Council in the mid-1960s urged congregations to adapt to a changing world, the order expanded its mission to include a variety of services for those at society’s margins, including immigrants, the homeless, the imprisoned, the sick, the elderly, and those with special needs. Dorchester residents Maria Barbosa and Maria Andrade, both from Cape Verde, said the sisters had, at St. Peter’s Church in Dorchester, taught immigrants to better express themselves in English and brought together disparate members of the diverse congregation. “They teach us how to stay together,” said Andrade, also 61. Quincy resident Maureen Mazrimas was taught by the order at Monsignor Ryan Memorial High School in Dorchester, and two of her cousins joined the order. She said she was overwhelmed by the generosity of their donations to the St. Patrick School and the WAITT House.